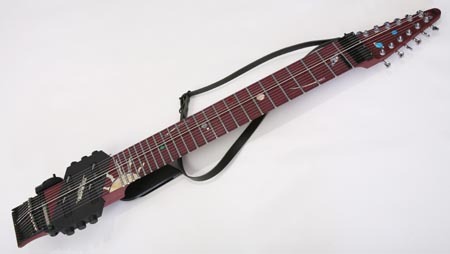 This "thing" that people are referring to is the Chapman Stick. 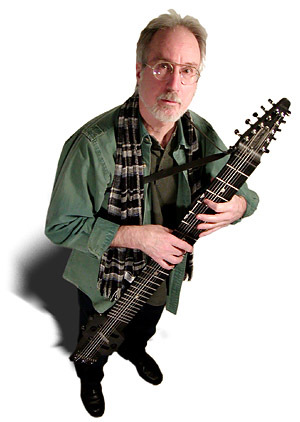 So what is the Chapman Stick? Is it a sitar? No. Is it a bass, a guitar? Well sorta. It is a bit of both with percussion and keyboards thrown in for good measure. In 1969,a young jazz guitarist by the name of Emmett Chapman suddenly discovered a new method of playing his guitar. 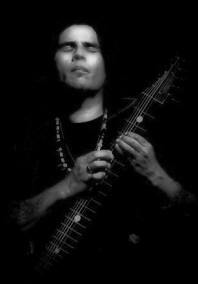 This method involved using all fingers of both hands to "tap" notes on the neck of his guitar. Both hands would orient on the neck in a manner that allowed the fingers to lay parallel to the frets and perpindicular to the strings. The right hand would cross over the neck and play melody lines and chords, the left hand would play in a more "traditional" manner and tap out bass lines and melodies. Both hands could play lines simultaneously, independently or interdependently, creating chords and melodies (think of a piano and its technique). Emmett's method of tapping on the strings with both hands would allow for greater control of expression via bending, legato, muting, volume, sustain, harmonics, etc. Thus we now have the Chapman Stick. Rarely is a new instrument conceived and transformed from paper to product and become so widely accepted and successful. Even more so remarkable is the fact that the instrument is the result of a technique realized from the heart of a daring musician wanting to express himself beyond the limits of "traditional" standards of execution on his instrument of choice. 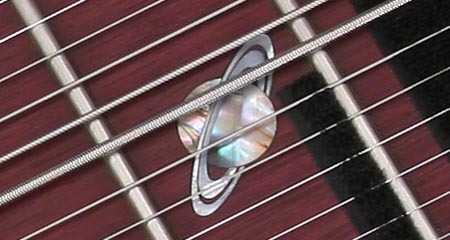 A 12 string Stick with The Block pickup owned by Steve Adelson. The "Solar Stick" is one of Steve's many customized Sticks. A close up of the "Solar Stick" and it's wonderful custom inlay work done masterfully by inlay artist Cliff Suttle of Shark Inlay. An authorized Stick forum and so much more.